Thank you for sharing with me and friends on ways we can repel deer from tree stand where the killers will be sitting and waiting for the poor deer . I am "brewing" up some great concoction right now and let it "ripen" for the season. heheheh. put everything into a large plastic container and let it ripen in warm garage for about a good month then pour all around the vicinity of tree stand. Do this every 5 to 6 days till the deer murder season is over. Start the peeing now because its only another 2 month before the senseless slaughter begins! THANK YOU FOR SUCH A WONDERFUL SITE I BEEN SHARING IF WITH ALL MY FRIENDS !! From The Webmaster: Thanks for sharing this site with your friends. Your encouragement helps me get in there and put several more pages up of information I have. Be sure to check out the deer feeder pages. On http://www.repellentreviews.com I am trying to do the same thing with homemade insect repellent, rodent repellent, etc. If you liked this comment, check out the misc. 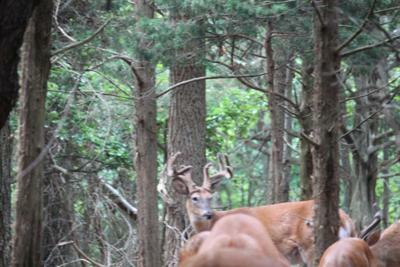 deer deterent page and watch the video about sabotaging deer stands with deer repellent. Oh my goodness.....a lot of folks kill the deer to have meat, not as a sport for fun. Hopefully, you feel the same way about an abortion clinic. God gave man dominion over animals not the other way around! That is a great thing to do. If we can repel these deer out of this place, maybe they could escape these horrible maniacs who kill deer for fun. I hope these deer make it out of this place.